To dress [?] Ham Bury the ham from 12 to 24 hours according to size & all of curing, before dressing [?] - put a small clove of garlic into the handle when you put it on to drip [?]. I never let it boil. White Soup Break the bones of a knuckle of veal well-put into 3 quarts of water with onions - celery - herbs - pepper - spice & salt. When the meat is all stewed away drain off the liquor. Let it stand till cold - take off the fat - have rice boiled & when you warm the soup add enough thereof to thicken it. Stir in a little cream. Soda Bread. 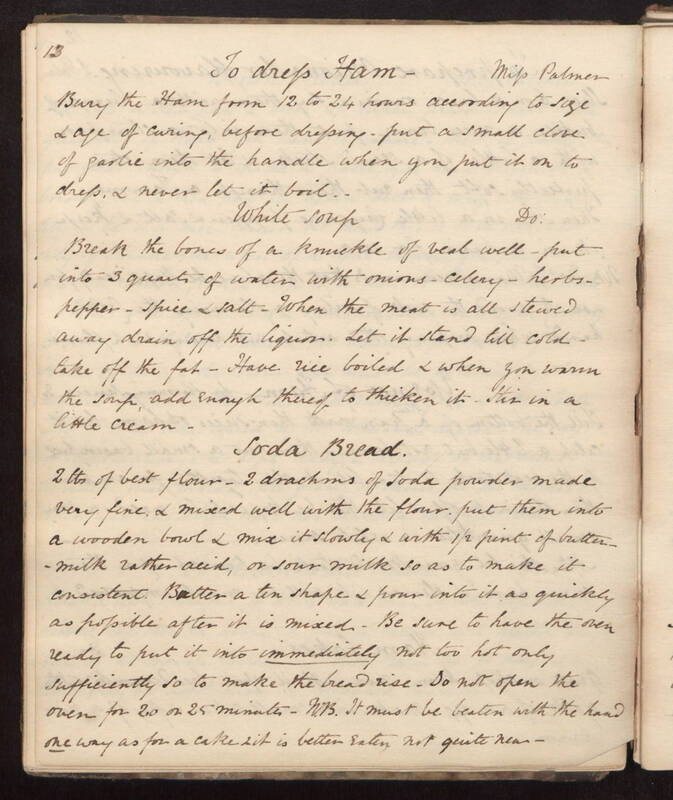 2 tbs of best flour - 2 drachms of soda powder made very fine & mixed well with the flour, put them into a wooden bowl & mix it slowly & with 1/2 pint of buttermilk rather acid, or sour milk so as to make it consistent. Butter a tin shape & pour into it as quickly as possible after it is mixed. Be sure to have the oven ready to put it into immediately [word is underlined] not too hot only sufficiently so to make the bread rise. Do not open the oven for 20 to 25 minutes. W.B. It must be beaten with the hand one [word is underlined] way as for a cake & it is better eaten not quite new.